Shelley Zimmerman was the first woman to ever serve as SDPD Chief of Police and her tenure of 35 years set a service record for sworn female officers. Born in Cleveland, Ohio Chief Zimmerman graduated Ohio State University with a degree in Criminal Justice. She graduated the FBI National Academy #241. During her career Chief Zimmerman worked many of SDPD's patrol commands as well as Vice, Narcotics, Internal Affairs, Multi-Cultural Community Relations Office, the Mayor’s Executive Protection Detail, The Narcotics Task Force and the Field Lieutenant position. Chief Zimmerman assisted in security planning for several large events in San Diego such as the Super Bowl, Republican National Convention, major conferences and the 4th of July Independence Day holiday at the beach, where more than one million local and visitors alike come to enjoy each year. 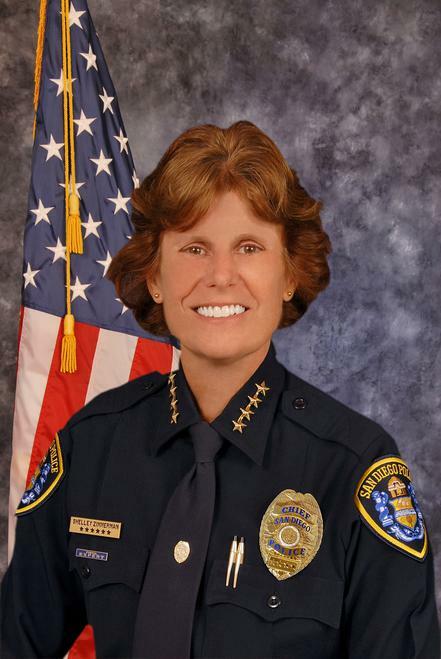 During her career Chief Zimmerman received numerous awards and citations including the San Diego Press Club Headliner of the year for her undercover work, the San Diego Business Journal’s Woman Who Mean Business Exemplary Award for civic involvement with the business and residential communities and the San Diego Police Foundation Women in Blue Award for her commitment to making San Diego one of the safest large cities in the United States. In 2013 Chief Zimmerman received the Gold Key Award from the San Diego County Hotel Motel Association. Her enrollment in the Deferrered Retirement Option Program forced her retirement on March 1, 2018. In keeping with his long stated, consistent support of law enforcement, on February 26, 2014, Mayor Kevin Faulconer nominated Chief Zimmerman as San Diego's 34th Chief of Police. Confirmed by a unanimous 8-0 vote by the San Diego City Council on March 4, 2014, Chief Zimmerman used her swearing in to clearly state she has high expectations for the police department and will be aggressive in implementing her priorities. In some of her first meetings with the media Chief Zimmerman stated she will instill a culture of excellence within the ranks and create a collaboration between the police department, the mayor, City Hall, the City Attorney and the community we all serve. "Imagine the possibilities" Chief Zimmerman said. Chief Zimmerman is an avid sports fan. In her spare time Chief Zimmerman participates in charity triathlons and recently completed a 620 mile bicycle ride that helped raise more than 1 million dollars for challenged athletes. To learn more about the chief watch her biographical interview with the UT San Diego.